It's always exciting to see the bees out flying in March, especially when they are returning with pollen. It means that the queen must've survived Winter and the colony is rearing brood. It does not, however, mean that the colony made it through Winter, so don't breathe a sigh of relief just yet. Generally a colony will not rear more brood than it can cover, but bees are reactionary, not predictive. They raise brood in response to incoming pollen. They don't know that March is our snowiest month. It is a precarious time for the colony. Both our colonies are bringing in pollen, so the focus of our hive management moves from providing just the right amount of ventilation, to keeping them warm. At this time of year, the top-bar hive in the greenhouse has a slight advantage over the Warré hive in the garden. BTW, the Warré will continue to receive pollen sub but no more fondant. We want the colony to eat its honey stores to make room for all the egg laying we're pushing for. 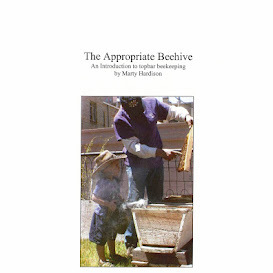 The TBH, conveniently still supered, is getting fed extra bits of comb honey yielded when we culled the old 2009 combs. The bees are going up and cleaning up, and they're even eating the old shiny pollen out of it. A hive in the greenhouse...what more could you want..well mabye an observation hive in the living room. My bees have been in the tree 2 days now...and it is pouring. They are in a nice tight cluster and lots of leaves...hope they make it till morning and decide the hive isn't so bad after all. I think I have the ant problem solved.